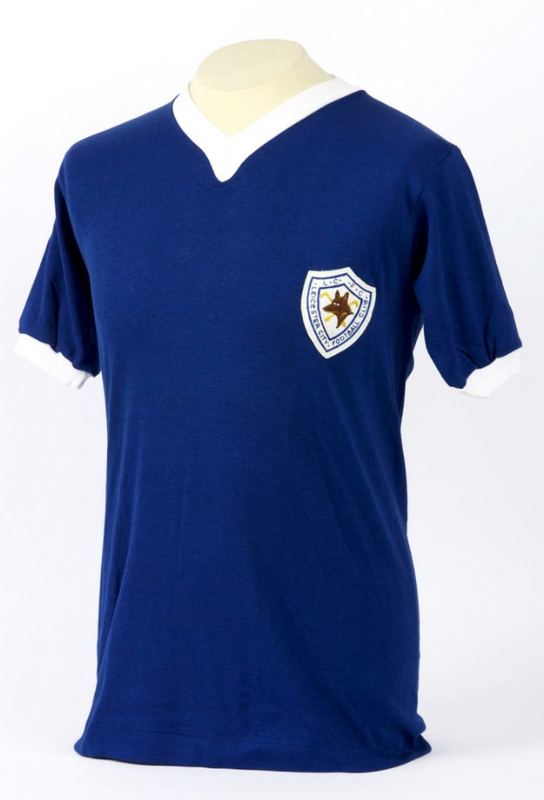 This shirt was worn by Leicester City’s Frank McLintock in the 1961 FA Cup final at Wembley. Frank had a trial with Leicester at the end of 1956, and joined the club part-time when he turned 17, although he continued with his painting and decorating apprenticeship at the same time. He would go on to work in the trade alongside his football career for a total of five years. The day before the ’61 final against Spurs, McLintock was to be found painting a cellar as part of his painting and decorating work. After Len Chalmers went off injured in the first half, Frank was moved from right-half to right-back to fill in, although 10 man Leicester fell to a 2 – 0 defeat. No subs were allowed at the time. This shirt is on loan from our collection to the National Football Museum in Manchester, where it is often on public display along with a range of other items.